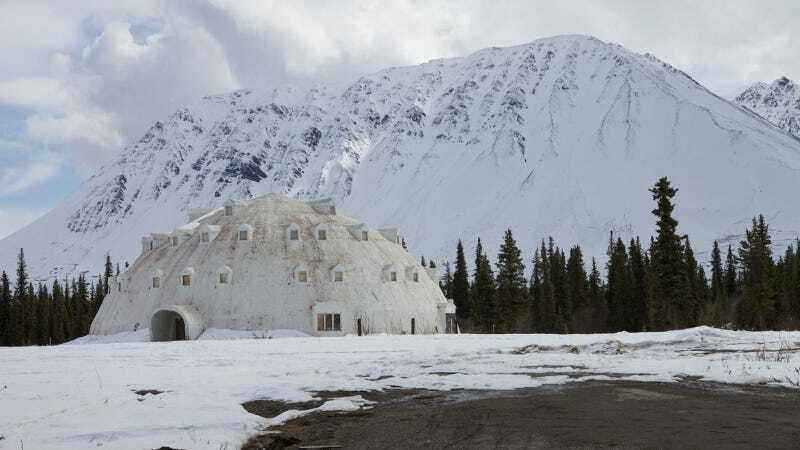 A wood-and-urethane igloo hotel has stood sentinel on the Parks Highway to Alaska's Denali National Park for over forty years, never once being occupied or operational. Tourists love posing with it, but nobody seems interested in running it, even at a bargain-basement price of $300,000. The structure is 80' tall and 105' wide. Smack-dab in the middle of Alaska, the nearest settlement is Cantwell (population in the hundreds), twenty miles away. The igloo has no power or utilities— it's just, sorta, there. Outdoor Hub says original owner Leon Smith had high hopes when he built it, but never could scare up the cash to complete construction. Apparently the only people who have been inside the igloo are vandals who once broke in to set off firecrackers. Smith had no less than three buyers back out until finally getting current-owner Brad Fisher to take it off his hands in 1996. Fisher quickly ran up against the same problems as Smith, and has been trying to unload the igloo himself on-and-off for the last six years. The Alaska Dispatch says the place is in a prime location for snowmobiling, hiking, hunting, and fishing; all the things you'd imagine tourists heading to Alaska for. "It's too good to tear down and I keep hoping, at some point, to put it to use," said Fisher. Nevertheless, he's never been able to connect the dots and get anything out of the hotel or the 38 acres it sits on other than set up a gas station and rent a few cabins. Besides marketing and figuring out how to get people to the hotel, the biggest barrier to making any profit off the property are the costs associated with completing construction and bringing the building up to legal compliances. Those bills are reckoned to be "in the millions." It's a tough proposition from an entrepreneurial standpoint, but it is a pretty sweet igloo. Whether or not he sells it, Fisher has no plans to knock it down. Will anything ever become of this cool property?